As we get older we realize that the journey ahead is never a straight path. It is a zig-zag that takes you forwards, backwards, sideways and through terribly deep brush. The journey ahead is one that has lots of forks and unseen trails and most of the time we’ll find that the most valuable detours are along those little seen footpaths into the unknown. As many Self Help books as people may write there is no one set of guidelines or rules to journey ahead. All you can do is to be true to yourself, true to those you love, as honest as you’re able to be, and to do as little harm and as few ill deeds as possible. And even all of that can get tossed out the window as you realize that everyone is trying to do the same thing – find happiness and a sense of place. Such is life. All of this is to say that when I started writing as a teenager in the 1990s, writing because I loved it, because it was the only thing I felt like I was not terrible at, and because my head was full of stories, I never would have believed I would be where I am today. I have written two novels, I have put out several books of short stories, and three books in a fantasy series. I have been vending at conventions for just over twenty years. I have been doing art shows and everything in between for over ten. I have written blogs for fifteen years, roughly. I have written movie reviews in some form for twenty years. PHEW! I am not a success with my writing but I have had a hell of a time with it. When I decided to call it a career last year I did so not out of anger or frustration but out of the sheer fact that I don’t want to become a joke. A punchline. I have nine books out. I love each and every one of those books and feel very lucky to have gotten a chance to put them out and to get them into people’s hands. I have gotten frustrated and burned out along the way, have questioned my skill, my self-promotion, and the path I was on and I will always wonder if the books are any good but I have never questioned my passion. I love to write. I have slowed down as I have gotten older and other things have come into my life but when I want to I can still throw a story down whenever it strikes me. So when I said I was done putting books out it was because I love myself and what I have done enough not to want to look like a clown. I have sold copies of every book I have put out but I am far from an economically successful writer and the last thing I want to do is to mortgage my future on something that isn’t working out. I also don’t want to be someone with a shelf full of books that I wrote which don’t sell. For me, and I can only speak for myself and will only speak about myself on this matter, I don’t want to become that author that keeps putting books out that people don’t want. I have said this a dozen times and I mean it. I can still write and put things on this blog and it isn’t the same but that’s OK. There’s a point where every hobby has to either evolve or die and I am willing to let mine evolve, or in this case, devolve a little. Ah, but that path ahead well, it sometimes swings you around so that you see your own behind, doesn’t it? I had no intention of writing another book. Again, not out of anger or childishness but out of pragmatism – why write a book I wasn’t going to put out. One night as I was lying in bed half-asleep a name came to my mind, a name and with it the skeleton of a story. The name and skeletal story stuck with me when I got up the next day and in no time I was roughing a story out and things were coming together in my mind. The story was inspired by two guests we had at the Flint Horror Convention in 2014, actors (directors, writers, and on and on) Chuck Williams and Daniel Roebuck, two friends who shared a deep love of horror that stemmed from their childhoods. Both men were what is known as Monster Kids, that is to say kids that grew up loving monsters and all things weird and wonderful. It was that sort of friendship and childhood which stuck with me and inspired the character in this new story. It was the mentality that monsters were cool and weren’t always the bad guy. As I finished the first draft of the story I realized that I really liked what I had. Liked it too much to relegate to being posted on a blog. I started thinking What If and I contacted a friend I have known since we were teenagers – which means for twenty some years now – about doing art for the book. He was immediately onboard and suddenly this little story was becoming something bigger – a book. I asked the advice of a friend, another writer who write’s kid’s book s from time to time and he liked the story and agreed with me about its potential. This could be more than what it was. A kid’s book. An illustrated kid’s book. My friend and I went back and forth about the look and feel and he was giving me some amazing sketches. I broke down what I thought would look good and he gave me more than I could have hoped. I had hoped I might be able to find a publisher for this book, and sent things out but of the eight I sent three were immediate rejections and I never heard from the rest. It’s been four months. You can see why I don’t put much faith in the mainstream publishing world. I’d rather control my own fate. That was not the only snag I was to hit though. Alas, my friend reached a point where he just wasn’t getting the look he felt the story needed and he had to step away. I was faced with the question of – do I find a new artist? Do I scrap the book? Do I do the art myself? I figured I would give the art a pass myself and started sketching out ideas. I toyed with a lot of looks for my main character and finally hit on it and when I hit on him the rest fell into place. As I was sketching though I realized that my skill was not up to the task I was asking of it. I have been drawing since I was a little kid and save for a stretch that was too long from my late teens to early twenties I was very serious about it. Unfortunately I was never really any good. That hasn’t changed. I can draw the occasional cute little image but it’s rare. It’s just not my forte. So now what? I’d do the book without art. I started thinking about the book, really thinking about it, and I realized that for the age range it was written for it didn’t need art. I would have LOVED there to be art, and I think it could be amazing with art but I also think that with this age range it gets dicey. It’s a book for young people but not one you want them to think ‘is for babies’. So I looked at the whole work, what I wanted it to be, what I wanted it to do, and I realized that it was strong as it was. I gave it one last pass and began working on layout and cover. The book, once I realized I was doing it without art, came together very, very quickly, the turnaround from hearing from my friend about the art to clearing the book to release and ordering copies was just shy of a week. 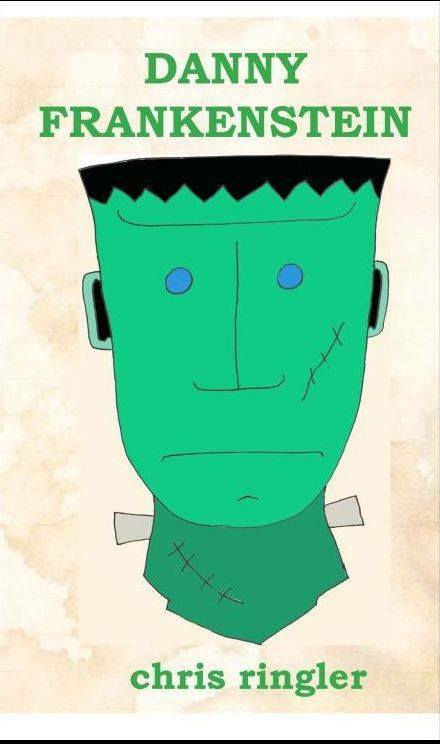 DANNY FRANKENSTEIN is the story of a ten year old boy going through a rough patch in his life. At every turn it seems that his life is being turned upside-down and shaken and the only place he has to escape the changes are in old monster movies. The only way he can hide from the pain is to become Danny Frankenstein, a mimic of the Frankenstein monster that stomped and stamped through the world and didn’t let things get to him. There is more to the story than that but I like some things to be a surprise and this is no different. It’s my love letter to Monster Kids, of which I was one – basically, it wasn’t the same in the ’80s but still… – and my love letter to the genre I adore. For me it’s a very important book. It’s the book I never planned. The book I never intended. I would never have told you I would write a straight up ‘kid’s book’ but here I am at 40 and I have. I don’t know that anyone else will give a damn but I do. If I stopped writing today and this book became a sort of legacy I wouldn’t mind that at all. I love all of the books I have written but this is different because it’s SO different than everything else I have written. We’ll see what happens next.